A case has been made for the late Harappans being the Vedic Aryans. What is your view? 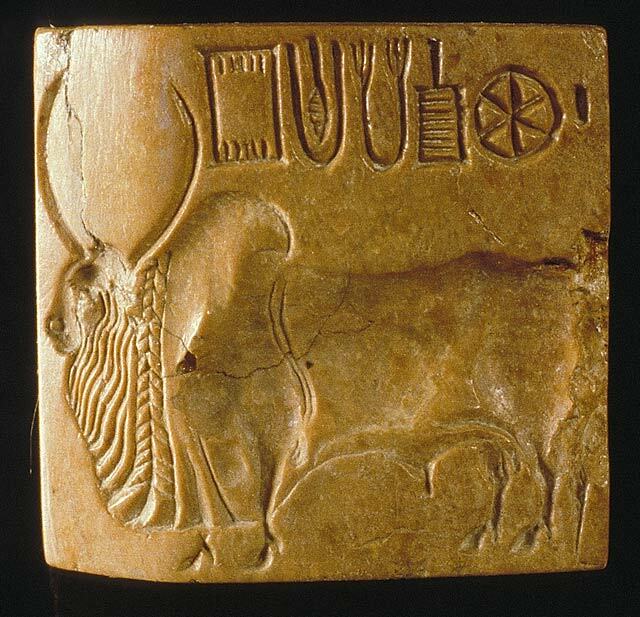 Zebu bull seal found in Harappa in the late 1990s. The rarity of zebu seals is curious because the humped bull is a recurring theme in many of the ritual and decorative arts of the Indus region, appearing on painted pottery and as figurines long before the rise of cities and continuing on into later historical times. I find the work of our biological anthropologists most relevant to this question and suggest you look at the book by Kenneth Kennedy, an expert on migrations, etc. based on examination of human skeletal remains. That’s where I believe the answer will come from. Along with his colleagues, it seems there is no evidence for the kind of massive migrations required to support the idea of an Aryan invasion or any other group for that matter. The Harappans did in the later phase interact with people of the Bactria-Margiana culture or BMAC. The BMAC appears to have become linguistically Aryanized by immigrants from the Eurasian steppes; the Proto-Aryan (Proto-Indo-Iranian) language developed from Proto-Indo-European spoken in south-eastern Europe until c 3500 BCE. But the Indo-Aryan speakers who composed the Rigvedic hymns seem to have come to South Asia in two major waves after the collapse of the Indus Civilization., c. 1600 and 1300 BCE. On the Proto-Indo-European speakers, see my paper in the Proceedings of the 19th UCLA Indo-European Conference 2007 (2008). I have discussed the archaeological correlates of Proto-Aryan (Proto-Indo-Iranian) and earliest Indo-Aryan in papers published in Studia Orientalia 64 (1988); Erdosy (ed. ), The Indo-Aryans of Ancient South Asia (1995); Carpelan et al. (eds. ), Early contacts between Uralic and Indo-European (2001); N. Sims-Williams (ed. ), Indo-Iranian languages and peoples (2002); Iranica Antiqua 37 (2002); Journal of Indological Studies (Kyoto) 16&17 (2005); M. Willis (ed. ), Migration, trade and peoples, Proceedings of the 18th Conference of South Asian Archaeology in London 2005 (2009). “Late Harappan” is a treacherous category. It includes all cultures that succeeded the Harappan, in the Punjab, Kashmir, Gujarat—actually these were several cultures. It would be useful if someone could trace out the precise artefactual elements that speak for a Harappan continuity in all these regions and cultures. If you can surf the internet try to locate Michael Witzel’s somewhat contentious argument for contact. I do not think that the Harappan civilisation was Aryan. According to linguistic and archaeological evidence accepted by most objective scholars in the world, the Aryan speakers entered the Indian sub-continent only when the mature phase of the Indus civilisation had ended and it was in deep decline or had collapsed. I would like to recommend you the most recent book by D.W. Anthony (2007: The Horse the Wheel and Language. Princeton University Press). According to my view the Vedic people were the descendants of both Sanskrit speaking Aryans and Dravidian speaking Harappans who had merged into a composite Indian society centuries before the Rig Veda was composed.